The next pairing of S.H. Figuarts for the popular Super Sentai series Ninpu Sentai Hurricanger, also known as Power Rangers Ninja Storm, is about to release, and thanks to an anonymous poster on 2chan we have some in hand images to share with you! Check out 20 images of S.H. Figuarts Kuwaga Raiger and Kabuto Raiger / Ninja Storm Navy Thunder and Crimson Thunder Power Rangers! Are these on your list to pick up? Because they look absolutely beautiful. Let us know in our discussion thread, linked at the bottom right of this news post! 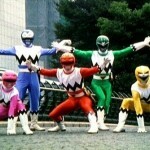 Ninja Storm, Ranger Form! Ha! Bluefin has just announced via Facebook that they will be releasing the Tamashi Web exclusive S.H.Figuarts Gouraiger and Hurricanger sets under their US Power Rangers Ninja Storm names! Each set will be priced at 89.99$ and will be released between late January and early Feburary 2014. Not so long ago we heard the news that the remaining S.H. Figuarts Hurricanegers would be released in 2-pack format toward the end of the year/beginning of 2014. 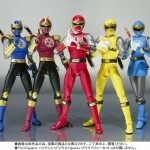 Now the Tamashii Web Store has started taking preorders for sets of the Gouraigers and Hurricane Blue & Yellow! The Gouraiger set, featuring KabutoRaiger and KuwataRaiger, will be released in December for the price of 7350 yen. The set featuring Hurricane Blue and Hurricane Yellow will then follow in January 2014 for the same price. 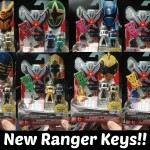 These sets are Tamashii Web Exclusives, so be sure to get your preorders in with one of the many middlemen available. In the meantime, check out the images after the jump! S.H. 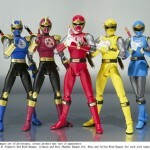 Figuarts Hurricane Blue, Yellow & Gouraigers Revealed! Hot on the heels of a weekend full of new reveals at Tamashii Features Vol. 6 we have a first look at the rest of the S.H. Figuarts Hurricangers! On display with Hurricane Red (due in September) we have what appears to be 2-packs of Hurricane Blue & Yellow and Kabuto Raiger & Kuwaga Raiger! There’s a suspicious lack of Shurikenger in this photo but 5 out of 6 so far isn’t too bad! As details become available we’ll update you with price and release details! Credit: Herotaku & Tokunation user Kamen blitz!